For several years, Jenny Shin was one of the LPGA golfers you watched play and thought, "This woman is a sure-fire winner." And, sure enough, today Jenny earned her first career LPGA victory at the Volunteers of America Texas Shootout. Shin closed with a round of 67, following earlier rounds of 68, 70 and 65, to finish at 14-under 270. That was good for the 2-stroke win over M.J. Hur, Gerina Piller and Amy Yang. Jenny was born in South Korea, but her family moved to California when she was still single-digits in age. When she was 10, Shin won the Los Angeles City Championship, and when she was 13 she won the USGA's US Girls Amateur. After more amateur success playing the AJGA circuit, Jenny turned pro in 2010. That year she won once on the Duramed Futures Tour and finished the season with three Top 10s in her final four starts, vaulting to No. 4 on the money list. 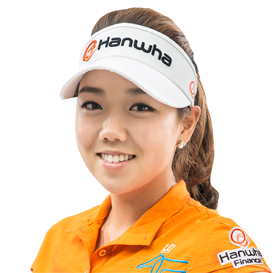 And with that, at age 18, Shin headed to the LPGA Tour for her 2011 rookie season. In 2011, Jenny had two Top 10s in that rookie season; in 2012, she increased her Top 10s to five and finished 30th on the money list. After a brief slippage in 2013, Shin moved up to 21st on the money in 2014 and was 26th in 2015. But her best finish remained a third-place recorded in 2014. Until the 2016 VOA Texas Shootout, and win No. 1. After several years of consistently good play - after several years of observers thinking, "no doubt she's going to win" - Jenny has that victory. "Win" rhymes with "Shin," after all.